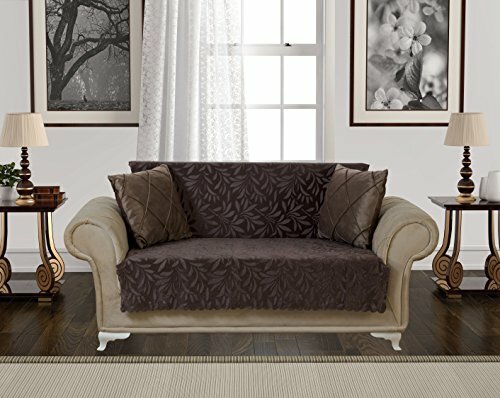 Anti-Slip Armless 1-Piece Sofa Throw Slipcover for Dogs Pets Kids Non-Slip Furniture Cover Shield Protector Fitted 2 & 3 Cushion Couch Futon Sectional Recliner Seater Acacia Loveseat Chocolate Brown by Chiara Rose at Home Decor Outlet Store. MPN: 43238-211560. Hurry! Limited time offer. Offer valid only while supplies last. LIFETIME SATISFACTION 100% GUARANTEED - Surely, you will love this product however, if you want to return it, we take all the responsibility for it WITHOUT ANY QUESTION. You are COVERED LIFELONG. You can return it free within 30 days after your purchase and you will have a refund immediately. Please let us know why you returned it. We really care about the feedback we get from our customers and always aim to promote our products accordingly. MAKE SURE TO READ DETAILED PRODUCT INFORMATION BELOW!